Making really awesome looking cupcakes for specific occasions and themes such as Halloween can be quite a frightful challenge for those of us who are not what you'd call natural bakers. I'll admit that when I'm really pressed for time I will happily cheat and go out and buy some ready or pre-made cupcakes which are already frosted. That's most of the hard work taken care of! Then I'll just add on a few little decorations to make them into more of my own creation. And also, I'm sure many people will agree, it can be pretty time consuming to just whip up a nice batch of cakes and then spend an age decorating them. That's when I'll use clever little toppers, cupcake picks and also edible sprinkles and decorations like candy. All Hallows Eve is supposed to be all about fun and not a cooking and baking chore. I can bake cupcakes from scratch if I absolutely need to - like when I'm doing a gluten free variety for family. 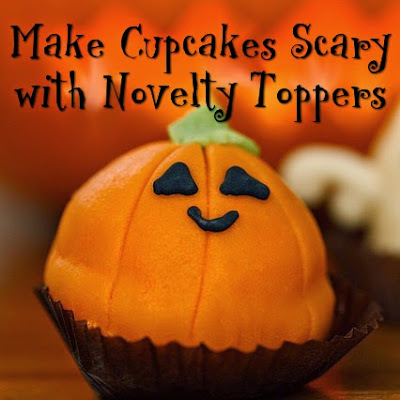 These days you're really helped considerably with some amazing Halloween themed cupcake toppers and picks that actually do a lot of the creative work for you. I saw some really cool scary and gory meat cleaver cupcake picks that look like they're dripping with blood. Perfect if you're having a bit of a bloody or even a zombie theme going on. To make a cheats version of a bloodied meat cleaver design, buy some vanilla frosted cupcakes, thin white paper liners, the picks (you can get edible knife icing decorations too) and some really red strawberry flavored topping or raspberry dessert sauce. You'll need to smear some of the strawberry topping inside the paper liners and make sure that it squidges (technical baking term there) up the walls of the paper liner before popping each cupcake inside. This goes contrary to what you'd normally be told but try not to get good quality paper liners because these will likely be too thick to show much of the red topping through. You actually want thin paper liners instead to get more of that bleeding effect visible on the outside. And if all of that seems like too much effort, just get some red liners instead! Now stick a cleaver topper or pick in the top and angle it at a slant so the bottom of the blade is touching some of the vanilla frosting. Carefully drizzle some of the red strawberry topping near the blade so it looks like it is dripping with blood. And, hey presto, you'll have some of the coolest cupcakes in town. Find some other ideas for making these small treats to scare your friends and family with. Of course there are lots more frightful ideas you can take on with your cake decorating. How about a classic black and white design with some haunted graveyard picks on top, or serve your guests their treats in the dark with some glow in the dark spiders. I really like the zombie hand picks you can get and I demonstrate how to use those on my really fun zombie cupcakes page how you can make some great looking party treats with those. As soon as I saw this great idea for a broken glass cupcake which looks really gory and appropriate for Halloween, I had to include it. It's such a fun idea and similar to the meat cleaver one too. Of course it involves more work although you could just stick with the bleeding idea and stick in a mini witch finger cookie. If you've not heard of those, Martha Stewart has a recipe online OR you can buy some plastic witch fingers instead and pop those in.